As a lover of small businesses I’ve always found it very authentic and comforting to hear from a company on a regular basis with details about what’s going on. What are they up to? What’s the deal with that website change? How many cats do you have in the office? Whether it comes from the founder, the CEO or a marketing wizard, inquiring minds want to know. AND, the best part is, it makes a company REAL. Members of the RTE team with RTY participant Jason Tregler. 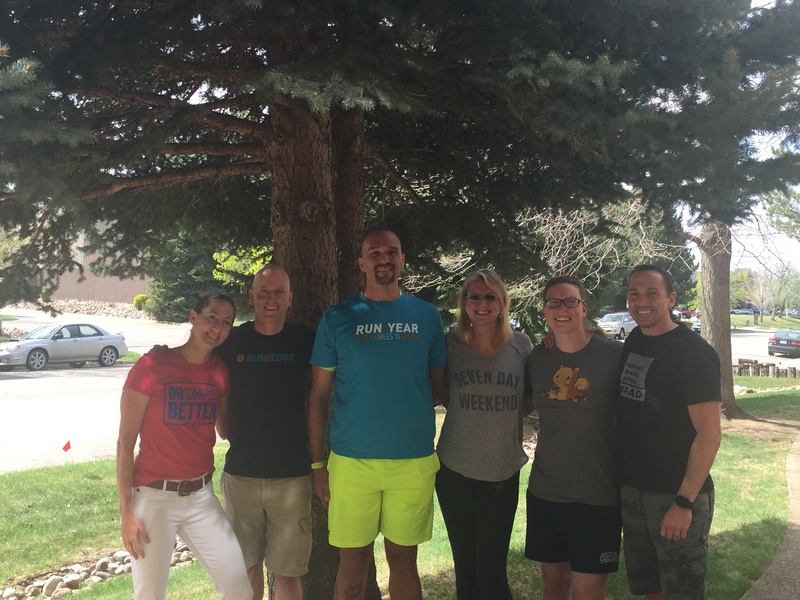 We love our participants – they are why we do what we do! If you talk to our founders, Adam Goucher and Tim Catalano, you will hear a very humble story of this journey starting with a book. It was something they both wanted to do for fun, not to make money or anything grand. They, like so many great success stories, wanted to do something different. The goal: Write a non-traditional running book, publish it themselves and see what came of the process. What transpired was as they say “history”. The book climbed to #2 on Kindle out of over 1 million books available. It launched speaking tours and the eventual creation of the Run The Year Challenge in 2015, a challenge that has now grown in numbers and strength every year since. <—Tim, Emily and Briana standing in front of our “canvas” board displaying a daily reminder of what we believe in and are trying to achieve! And just like that, they said out loud what RTE is all about. In those few hours what was revealed was a clear purpose, audacious goals and an aspirational destination. Our ever magical “why” became crystal clear: Everyone Included, Everyone Challenged, Everyone Successful. We knew this principle had to guide everything we do. ANYTHING we produce at RTE must meet the requirements of this statement or we no longer are holding true to who we are. We have noticed, like so many of you have recently, that we are living in a world that is more and more judgemental and exclusive. It seems we are encouraged to focus on our differences rather than our common ground. We feel that we have the opportunity to use our purpose, our why, to reverse that. It might sound lofty, but any big goal worth pursuing is. Either we sit on the sidelines complaining about the way things are, or we jump in the game and fight for the finish line we know is waiting there for us to cross if we dare. 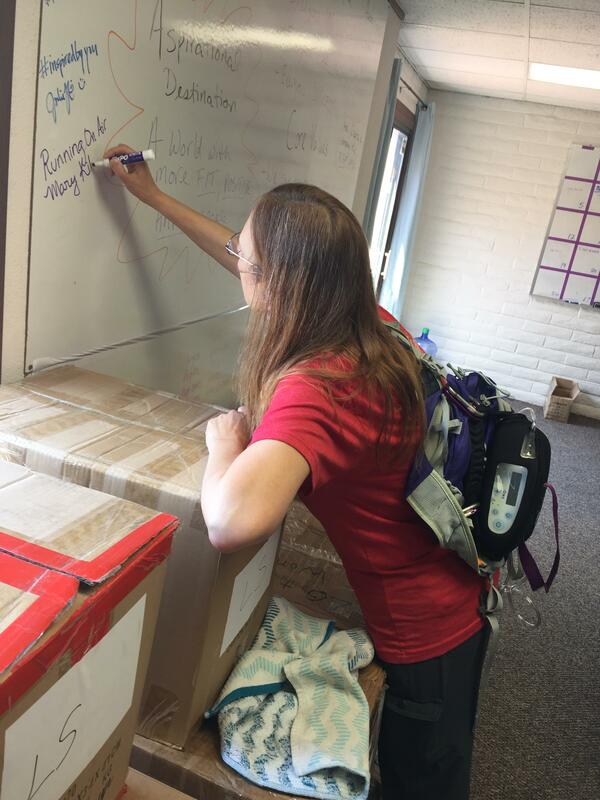 Legacy participant Mary Kitlowski signing our white board on a visit to the office. Mary runs despite having Primary Ciliary Dyskinesia (PCD), 40% lung capacity and using oxygen. 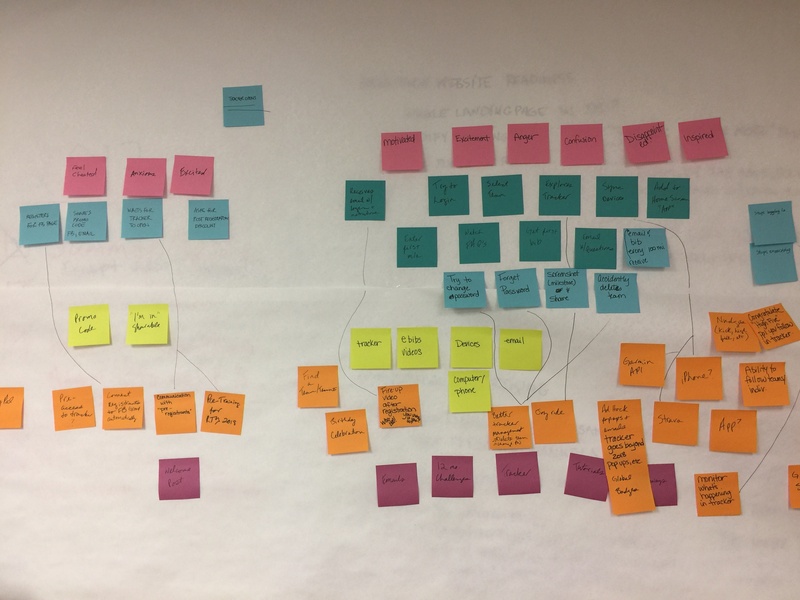 Journey mapping and idea hatching…always dreaming up new ways to spread our message. Looks like wildfire don’t you think? I wanna work for/with you guys/gals. Sounds like an awesome, although a little crazy (I would fit right in) place to work. Well, from I just read, I don’t how much “work” is done. Thanks to all of you for all that you do for and with runners. I have been having some struggles for the past couple of years and especially the past year after suffering two strokes, within 10 days, in October on 2017 and then bronchitis that took me through the remainder of the year and into 2018. Not to include the heart attack in January of 2015. Not sure what happened this past year, but I was having a VERY hard time getting out the door to run. I was getting aggravated with myself and my girlfriend, who is a runner, was doing her best to keep me encouraged and motivated and was getting extremely aggravated and upset with me and “Woe is Me” on an almost daily basis. We both joined up with a friend to do the RTY2018, but that didn’t really motivate me, but I have gotten out some. Then, Hug A Runner 2018 came along and with it, the 10 day challenge. Not sure why that has motivated me more than anything to get out and start running more again, but it has. Could it be the chance of winning $500? Well, that does play a role. Could it be that the fact that I have run several races (mostly 5K and 10K with a couple of 5 milers thrown in-on the roads and trails) with little to no training and have a 20 miler coming up in 3 weeks that I have not trained for at all and have felt like dying at the end been a factor? Could it be that my girlfriend YELLED at me last week about not being prepared for the upcoming 20 miler as she is doing the 40 miler and she will concerned about me the whole time and that I would be to exhausted to help her and take care of her after she finishes (along with some crying and lots of tears) that woke me up? The fact that we have a friend that has been “Woe is Me-ing” as much or more than I have and I was getting aggravated with him and realized what I must sound like to others? All of the above? Whatever, I have been running for three straight days now. Thanks, in part, to HAR 2018 and RTE. Thank you, from the bottom of my shoe soles. Now, where do I apply for a job?